VietNamNet Bridge - Local newspapers noted six noteworthy events in e-commerce in 2018. 1/ In March 2018, rumours were that Amazon would open in Vietnam, but a representative of Amazon later explained that the giant only planned to support businesses in Vietnam to sell products on Amazon. 2/ Zhang YiXing, 36, a Chinese national, has been appointed the new CEO of Lazada Vietnam. He took office on June 21 and now acts as Lazada Vietnam’s legal representative. The post was previously held for four years by Alexandre Joel David Sylvain Dardy, 42, French National. Zhang YiXing was the assistant to Daniel Zhang, who is the successor of Alibaba’s president Jack Ma. Before the appointment of Zhang YiXing, Alibaba had replaced Lazada Southeast Asia manager by appointing Lucy Peng as the new CEO. However, just after nine months, Peng resigned, giving the post to Pierre Poignant, a co-founder of the e-commerce firm. The high-ranking personnel assignment shows Alibaba’s ambitious plan to restructure Lazada after it poured $4 billion into the largest e-commerce firm in Southeast Asia. Vuivui.com, which was predicted to surpass Thegioididong.com after four to five years, shut down just after two years of operation. Since November 27, the clients accessing vuivui.com have been redirected to the website of Bach Hoa Xanh. 3/ In early August, many Vietnamese parents discovered serious problems in the maps for children they had bought from Shopee. The maps showed a ‘cow tongue’ fabricated by China to distort history. Shopee immediately pulled down the product from the platform and locked the seller’s account. Appropriate agencies seized 30 boxes of the maps from Shopee. The incident rang the alarm bell over the e-commerce trading floors’ capability to control product quality. This is why low-quality, counterfeit goods and illicit products are available on online markets. 4/ In mid-August, Asian press reported that eight investors, headed by SBI Holdings from Japan, poured another $51 million into Sendo, an e-commerce website. The investment will help Sendo to compete with other rivals in the fight for market share which has expected value of $10 billion by 2020 and growth rate of 30 percent per annum. Also in 2018, Alibaba invested $2 billion more in Lazada Southeast Asia, while SEA pumped VND1.2 trillion, or $50 million more into Shopee Vietnam. However, despite big investments, e-commerce firms in Vietnam all reported losses. The other big players in top five include Lazada, Tiki, Sendo and Adayroi. 6/ Vuivui.com, which was predicted to surpass Thegioididong.com after four to five years, shut down just after two years of operation. 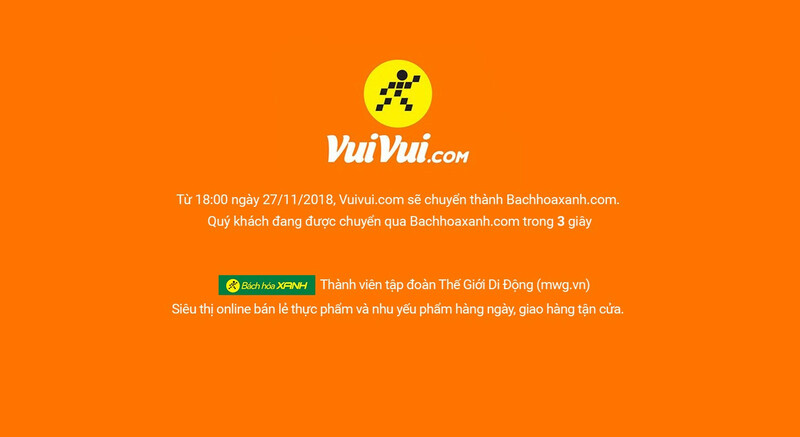 Since November 27, the clients accessing vuivui.com have been redirected to the website of Bach Hoa Xanh.